As soon as I got back from vacation and checked my Facebook newsfeed (probably the best way to catch up on anything newsworthy that I missed during my 2-week internet hiatus), I saw about 20 posts about Jeremy Lin. Former Harvard basketball player turned Knicks NBA star, Jeremy Lin for the past week has been the subject of posts from my Harvard friends, my Asian friends, my Harvard Asian friends, my New York friends, my basketball-loving friends, my friends who haven’t watched a single game of basketball…and my newly added Taiwanese friends. I’ve never seen so many statuses in Chinese about a U.S. athlete since Chien-ming Wang (former Yankees and current Nats baseball player from Taiwan). “Are you friends with him?” (I wish). It’s funny that many of the Taiwanese people I’ve talked to are still most impressed that he went to Harvard (giving off the impression that secondary is his basketball skill and his ability to succeed in the NBA despite many odds). Maybe they are studying his “How to get into Harvard” video more accurately than he intended. My colleague asked me about him today: “Have you heard of this Taiwanese basketball player, Lin?” She was very surprised when I told her America is going even more “Linsane” than Taiwan. “Is he very famous in America?” she asked, eyes wide. Apparently Taiwanese people are used to the fact that people with Taiwanese heritage might be more well-known in Taiwan than in America. She assumed that Taiwanese media was covering Lin more than American media. 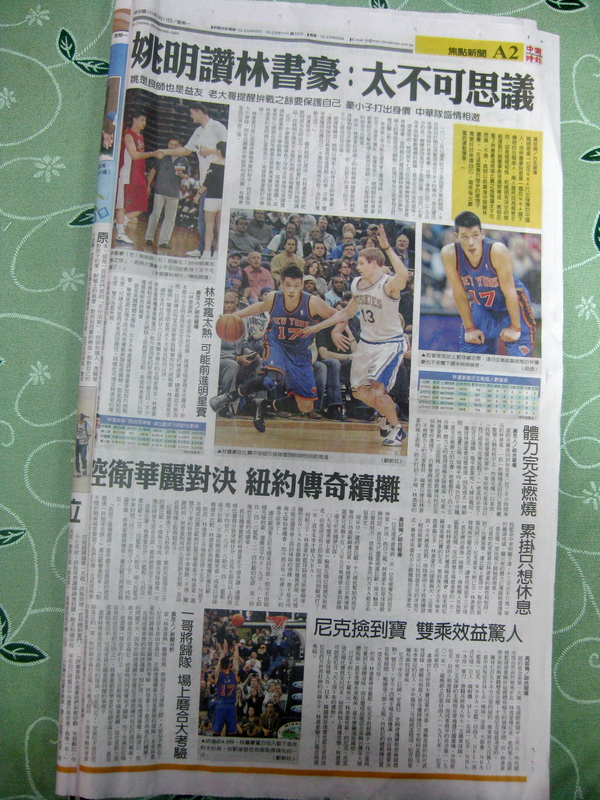 Lin’s recent winning streak catapulted him to today’s 中國時報 (China Times, a top Taiwan newspaper) front page and front inside cover…from what I could read in Chinese, they don’t have the whole slew of Lin puns going on here (Linsanity, All I do is Lin, etc), but they call him “豪小子”(Kid Hao, using his Chinese name). They have pictures of him with the towering Yao Ming, and him on a recent visit to Taiwan in August 2011 where he met with a boys’ basketball team. 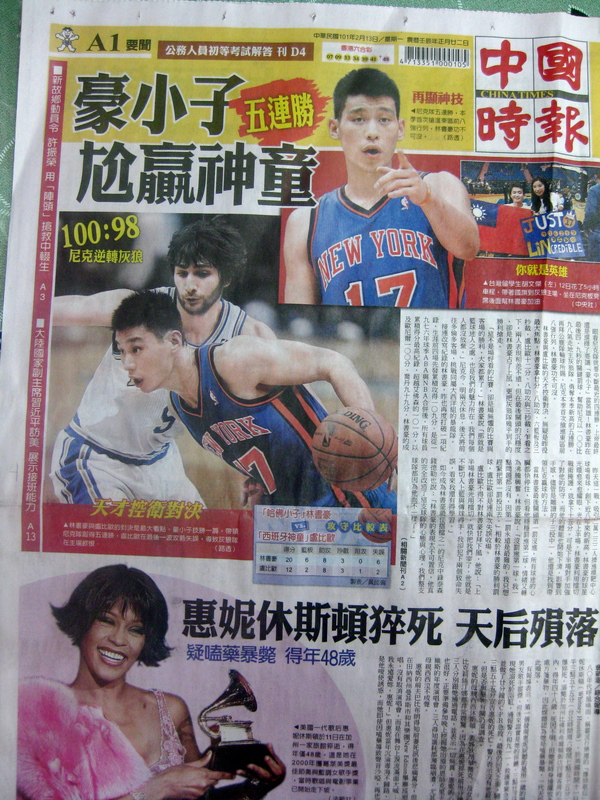 They also write that the Taiwanese basketball team wants him to come back and visit Taiwan again. This article argued that Taiwanese people are too quick to claim Lin as their own pride and success. It writes that even his parents are American citizens now, and he was born and raised in America and with an American education—he can’t be considered Taiwanese. But this assumes that to be “American” is to have an identity that is singular and exclusive, and ignores the fact that Lin’s Taiwanese heritage is part of his story and part of even the American media maelstrom. Lin has been back to Taipei even if he’s not a Taiwan citizen, even from a career standpoint—he played in Yao Ming’s 2010 charity tournament, considered offers from the Chinese Taipei men’s basketball team before joining the Warriors, and was named MVP of a tournament he played in Guangzhou, China. If you read the section on “racial issues” in Wikipedia, there are countless examples of how his race has factored into the way he’s been treated on or off the court. There are also examples of the people who stuck up for him—teammates, coaches, fans. That is why Taiwanese people and other minorities in America can identify with his success in some part, for the part of their identity that is shared and imagining the similar experiences they might have, however few or many. 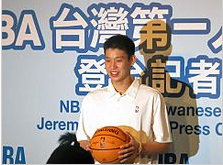 The average Taiwanese person can probably relate more to Jeremy Lin than to Yao Ming or Kobe Bryant, as much as they might idolize the latter two. And I think that’s what it comes down to—relatability. As long as Lin continues to be a good role model, it’s only natural and even beneficial that Taiwanese people, or anyone who wants to, can claim him as their own. Everyone wants to be recognized for Linning.